Real Men Read is a mentoring program in which men volunteer at least one hour a month to read to students in third grade. This entry was posted in Volunteers and partnerships and tagged Real Men Read on March 22, 2017 by HISD Communications. 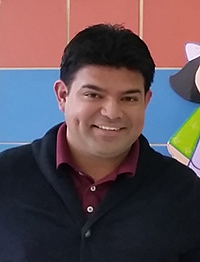 In this week’s “I Am HISD,” which features district students, graduates, employees, volunteers, and other team members, probation officer Juan Sorto talks about what prompted him to become a member of HISD’s Volunteers in Public Schools, why he is so passionate about working with students in the North Forest area, and who inspired him to reach for greatness as a child. You approached HISD several years ago with a very specific request: to volunteer in schools that used to be part of North Forest ISD. Why was serving students in that part of town so important to you? I moved to the North Forest area in 2001, and I still live there today. It has a lot of students who are in the same situation I was as a kid. They are growing up in the same condition—poverty. I was raised by a single mother who didn’t know any English and barely finished the second grade, and I was the first person in my family to graduate from high school and go to college. When I finally reached a level where I was stable in life and had a disposable income, I wanted to get more involved with kids who were struggling themselves but maybe didn’t know how to succeed. This entry was posted in News and tagged I Am HISD, Juan Sorto, news, North Forest HS, Real Men Read, Shadydale ES on January 12, 2016 by HISD Communications.